Are NevrDull and green scouring pads abrasive? Is NevrDull abrasive? I know their website says it’s not abrasive, but, does it remove steel from surfaces? I read somewhere, some time ago that whenever your cleaning fabric turns gray it means that there’s metal being removed. Also.. Is a Nylon scouring pad like the green 3m kind, enough to remove steel? Is it abrasive to steel? I want to know if I’ll get my equipment out of spec and tolerance if I use 3m pads to scrub and remove superficial rust. I’m talking about a Vandercook, I know these machines are machined to a thousandth of an inch with a very narrow tolerance. A scouring pad made of some form or nylon will do little or no harm to your machine if you are taking off surface rust , obviously as you mention the grey stain indicates removal of material but its not as if you will take much out just cleaning up . I copied the following from the Challenge cutter company website. Here, at least, is one recommended example of the use of nylon scouring pads to clean metal. 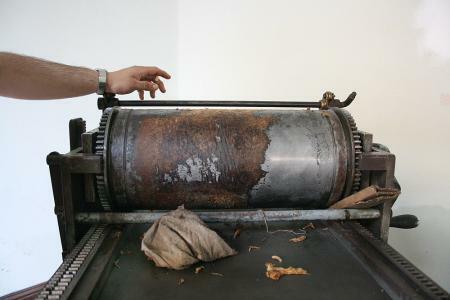 “The table of a paper cutter requires periodic maintenance to remove surface oxidation. Thanks guys, this is good information, but I want to hear someone saying like 100% sure and completely positive that it won’t get my machine out of spec. Just want some peace of mind. iron oxide “rust” as we call it is in itself a very tough abrasive, if you rub at it with a plain cotton rag dry with nothing added it will come clean if the rust is only on the surface ,that said you want to do it quicker so you get some sort of abrasive , scotchbrite nylon pads are where i would start with steel . Dont use it on soft non ferrous metals . The word ferrous oxide that you see on the abrasive papers is basically a formulation of “rusts” applied to a backing material , whatever moving part you remove rust from will wear more slowly at contact points without the rust so it has to be removed anyway and its not until you have got to your finished state you can be sure if the part is re usable or not . Restoring to spec in the case of a press thats 200years old is a tall order unless you have mills and good turning abilities . Having a knock or two in some of your linkages wont hurt , the main shaft that the platen hinges on is the one you dont want to distort or cause play to appear in ,other than that i would say your fears of damage are pretty groundless . Vandercooks were actually made to a .003” standard in many parts, and all are less than 100 years old. Thanks again, guys.. Maybe I should have posted a photo of what I’m working on.. This is the impression cylinder after some Evapo-Rust application, but there’s really old tympan paper stuck to the rust on the cylinder and it makes it harder to penetrate the rust. What makes me doubt it I should use scotchbrite pads, is that after scrubbing with them, I can see very fine but visible marks, I mean it actually removes the rust, but I’m afraid of overdoing it. I have had to deal with something similar to that before. I just used a fresh razor blade and minimal pressure to get underneath the stuck paper. Go slow and if you accidentally damage the razor blade then switch to a new one. This will be far more effective than abrasives. Thanks for your suggestion, Dan. I think I’d be more afraid of using a razor blade.. But I’ll follow your suggestion and see how it goes. Enrique there are blades with only one sharp edge ask in a craft shop . Ok, so I did follow Dan’s suggestion. I was afraid to damage the cylinder with the blade, but I started slow and with minimal pressure, and once I got the hang of it, all the paper started peeling off very nicely. Now the amount of rust is minimal and should clean up really well with Evapo-Rust.